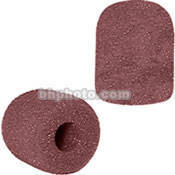 The WindTech 500 Series windscreen features a 1/2" inside diameter and 1-1/4" inside depth. The windscreen is a suitable replacement for select lavalier, headset, and small instrument microphones manufactured by AKG, Audio-Technica, Audix, Sennheiser, Shure, Beyerdynamic and Crown. Color: Brown.